“`Universal Pictures and The Film Foundation has announced a multi-year partnership to restore a couple of handpicked selections of classic productions, with Oscar-winning directors Martin Scorsese and Steven Spielberg lending a hand. Universal will fund the restorations, as well as provide research and technical services. 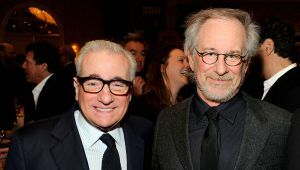 Through The Film Foundation, Scorsese and Spielberg will be personally involved in the process, contributing their unique artistic expertise and historical knowledge throughout the restoration process. “`The Film Foundation was established in 1990 to protect and preserve celluloid history. By working in partnership with archives and film studios, this nonprofit foundation has helped to restore more than 800 movies, which are made accessible to the public through programming at festivals, museums and educational institutions around the world. “`The 2018 restoration slate will include Destry Rides Again, Winchester ’73, My Little Chickadee, and both cinematic versions of Hemingway’s The Killers, with additional titles announced in the coming months. “`A collaborative partnership marks an added step in Universal’s film restoration initiative announced during the studio’s centennial in 2012. Over 70 works have been fully restored, including All Quiet on the Western Front, Dracula, Double Indemnity, Frankenstein, Touch of Evil, Schindler’s List, Jaws, Out of Africa, High Plains Drifter, Pillow Talk, Bride of Frankenstein, To Kill a Mockingbird, Spartacus, Duck Soup, The Sting, The Birds, and Holiday Inn. “`In 2015, Universal launched a silent film initiative. The company has so far restored 15 titles, including Outside the Law, Sensation Seekers, and The Man Who Laughs. “`The restored versions will be screened at film festivals and archives around the world. This entry was posted on Thursday, May 3rd, 2018 at 4:37 pm	and is filed under Blog by Manny Pacheco. You can follow any comments to this post through the RSS 2.0 feed. You can leave a response, or trackback from your own site.